I was excited to get some seed from the APS Peony Seed Distribution Program this year. Since I've been a member for a few years now, this program has been available to me in the past, but I've never taken advantage of it. Somehow it was a bit more enticing to be able to select the seeds in person instead of ordering them through the mail. I got 9 packets of seeds, 8 of those packets were species peonies. 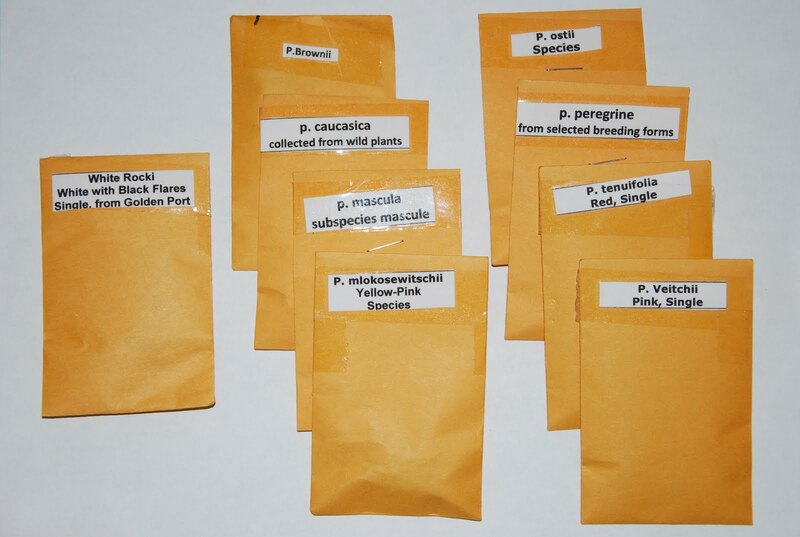 The species seeds were $2.50 per pack and the cultivar seeds were $3.00 per pack. So I spent $23.00 in seeds. Not too bad. The seeds that I got were: P. brownii, P. caucasica, P. mascula, P. mlokosewitschii, P. ostii, P. peregrine, P. rockii, P. tenuifolia, P. veitchii. I am really excited to see how well these grow for me.